Can the SCO Bring India and Pakistan Together? With multilateral counterterrorism exercises, the SCO may help bridge the gap between Islamabad and New Delhi. 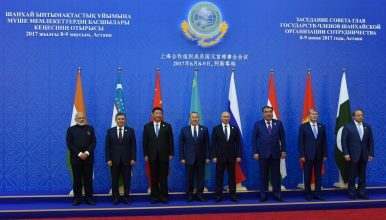 Since Pakistan and India’s formal induction into the Shanghai Cooperation Organization (SCO) last year, the group now represents 40 percent of the world’s population and almost 20 percent of its GDP. Bringing these two South Asian neighbors into the folds of the SCO in June 2017 initially gave rise to conjecture as to whether they could coexist. On a positive note, in the SCO the participation of all member states in its activities is mandatory so interaction and dialogue is unavoidable. Considering the tense relations between India and Pakistan, it should be interesting to see them participating in multilateral military exercises under the auspices of the SCO, as the memorandum of obligations makes joint military exercises compulsory. Held every two years, the Peace Mission counterterrorism exercises focus on combat readiness and coordination for any eventual joint counterterror operations. Participants take part in joint drills, training and information sharing. Agreeing to uphold the maxims of the “Shanghai Spirit,” defense ministries and armed forces of all the SCO member nations continue to adhere to the same rules as announced on June 15, 2001 when the organization was created by founder members China, Kazakhstan, Kyrgyzstan, Russia, and Tajikistan as a Eurasian political, economic, and military organization. Engagement, interaction, and dialogue will continue throughout the year. An event by the name of “Fanfare for Peace Military Tattoo” will be held, followed by a meeting for defense ministers from all the SCO countries, according to the Chinese Defense Ministry. It is expected that these measures would further enhance defense coordination, internal solidarity and integration of the group. Apart from exercises like “Peace Mission 2018,” India and Pakistan are now also part of the Regional Anti-Terrorism Structure (RATS) based in Tashkent under the SCO. Under this arrangement both member states have to agree to exchange information and combat terrorism under its auspices. The SCO platform encourages multilateral cooperation in trade, energy, education, and tourism as well. Widening the ambit further, China has also proposed that a treaty be signed by members for legally dealing with issues such as separatism, extremism, cybersecurity, and drug control at the 12th session of SCO Security Council secretaries in Astana, Kazakhstan. Establishing a lasting mechanism of communication between India and Pakistan would be no mean feat, as the bilateral relationship goes through extreme highs and lows. Often seen as a regional power-group of nations, SCO still has to prove its effectiveness beyond the inner circle of China, Russia, and Central Asian countries. Bringing together India and Pakistan may not be a litmus test, but it goes a long way toward establishing the SCO as a powerful platform. Optimistically, Alexander Lukin, director of the Center for East Asian and SCO Studies at the Moscow State Institute of International Relations, under the Russian Ministry of Foreign Affairs, feels that the SCO “will provide a new and important platform for India-Pakistan dialogue.” Having successfully helped China, Russia, and the Central Asian republics ink agreements regarding deployment of their conventional forces on borders, the SCO could become an ideal confidence-building mechanism. Working together toward the same objectives on the same platform helps in removing mistrust and promotes dialogue on diverse matters. This multilateral cooperation could eventually pave the way for more bilateral interaction in trade and other fields for India and Pakistan. Sabena Siddiqi is a foreign affairs journalist and geopolitical analyst with special focus on the Belt and Road Initiative, CPEC, and South Asia. India and Pakistan Are Set to Join the Shanghai Cooperation Organization. So What? India and Pakistan will join the SCO, but that doesn't necessarily mean the SCO will start to matter more in Asia. India-Pakistan Tensions Test the Shanghai Cooperation Organization's MettleThe Shanghai Cooperation Organization: Harmony or Discord?It's Official: India and Pakistan Join Shanghai Cooperation OrganizationSCO Set to Expand, Adding India and PakistanIndia and Pakistan to Join SCO, Is Iran Next?